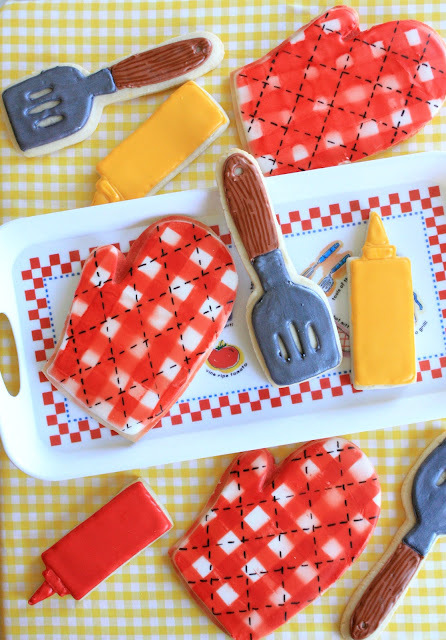 The other day I found a flat, plastic BBQ mitt and spatula at the store (cake decorations) and instantly thought of cookies. Sugar cookies topped with royal icing, to be exact. Yippee! The cookie version worked out pretty well. I utilized the same gingham technique on the mitt (borrowed from Glorious Treats) that I used on my gingham picnic cookies. I added the stitching detail with a black AmeriColor Gourmet Writer. The spatula is brushed with silver luster dust, if you can't tell, and the wood grain handle is given detail with a brown Gourmet Writer. In the beginning they were faceless, but they looked so plain. To make these little guys I used a rectangle cookie cutter and cut the rectangle dough in half. At the top, I cut in from the two sides to represent the twisty part, and then the pointy top was cut out freehand and placed firmly on top. Store-bought icing eyes and edible marker smiles finished them off, and there you go! These sweet little fellas should bring some cheer to any dad on Father's Day, and hopefully will satisfy their taste buds too! Make some for your own "Grill Master"! Seriously you are a genius! These look terrific! OMG! These cookies are so ridiculously cute. I just had to pin them and share on FB. Love them! I love that gingham effect, I needed to make some the other day but the spray costs around $30 over here and I was too cheap to buy it, now seeing yours I so wish I did. The cute ketchup and mustard bottles are totally my favorite. These are entirely too cute. I love the little googly eyes on the bottles. So fun! I just love these to pieces! What a fun addition to any BBQ! You are just so creative!!! Super cute and perfect ideas for summer! These are adorable!!! I think the little bottles are plotting how to steal themselves a hot dog! Oh Sue these are adorable and PERFECT for Father's Day! Great job and thanks for sharing! These are SO much fun!! I really love the googly eyes, they take those cookies to the next level. Wonderful set of treats!! The oven mitts are just too cute! Oh my goodness! You always amaze me with your creativity and talents. These are so adorable!!! 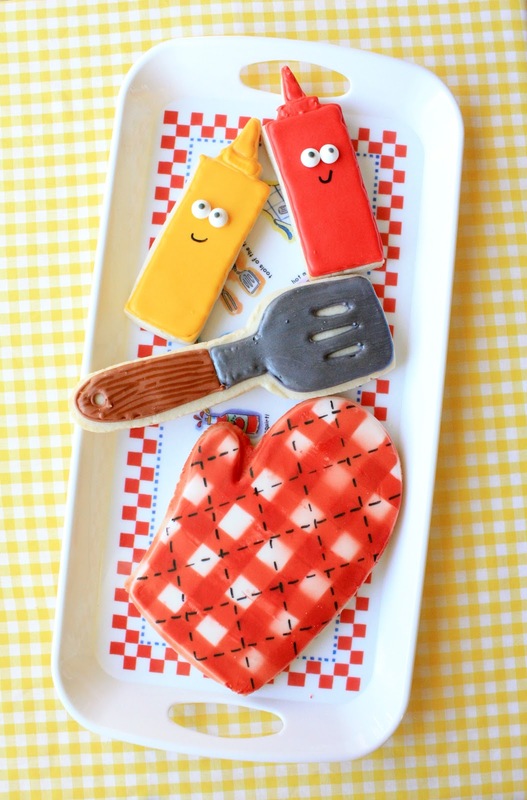 Yes, that pair of eyes and a smile brought these cookies to live! I love them. Oh my goodness Sue! These might just be my favourites of your cookies! They are so adorable! :D Each bottle of ketchup has a different expression! What a perfect way to commemorate Father's Day! I can't imagine a single dad who wouldn't adore them. This is what I love about your creativity - you went the extra step and put eyes on the ketchup and mustard. This set is beyond adorable. LOVE! Stinkin' stinkin' cute! Love everything! You are the coolest mom and grandmom around. Those ketchup and mustard bottles are killer! SQUEEL!!! I'm in love with your mustard and ketchup bottles! These are so adorable, Sue! You truly are amazing! And the addition of the eyes is awesome!!! These are the cutest cookies I've ever seen! Oh my! These cookies are sooooooo cute!!!! These are just too stinkin' cute!!! Absolutely adorable! Love the little faces. How Adorable!! I can't make cookies to save my soul, but would love to be able to make these! how adorable! perfect for dad's day! thanks for sharing! girl, you are seriously the most amazing baker everrrr.... i totally added these to my special post about father's day bbq ideas! Wow, your cookies are great! You did an amazing job. Those are too cute, Sue! What perfect cookies for summer. These are so adorable! Love the little eyes. Those are the cutest cookies ever! These are such a fabulous treat for all dads. As always....you are so talented and creative. Cutest cookies I've ever seen. Love the ketchup and mustard bottles. So clever! Oh my. I don't think even the meanest meanie could look at those smiling ketchup and mustard bottles and not crack a smile. oh, my gosh! These are adorable! I have been dying to make the gingham cookies since I saw your post and the one on Glorious Treats. I got a Michael's gift card for my birthday. I WILL buy some spray paint! The ketchup and mustard are just so cute! I can't get over them. I wiwh I had seen this post come FD, but these would be great all summer long for BBQ's - NOT that I could actually pull even one off! They are AMAZING, Sue! These are adorable! Found you from Something Swanky!! These are unreal. The expression on the faces of the K/M bottles is PRICELESS!